Consuming dried fruits is a healthy add-on to your diet, but if consumed more than required, they may comprise of unpleasant effects on your weight. The ideal consumption includes small proportions of about 2 tablespoons, so eating directly from the bag can cause overeating. Make sure you read the nutrition facts on your dried fruits and avoid other varieties that had sugar or sweeten them with fruit juice to reduce excess calorie intake. Your diet should be high in fiber, and dried fruits are a high source of fiber. Fiber helps in regulating and promoting good bowel health, but too much of fiber can bother your gut as well. Too much of dried fruits consumption can lead to gas, bloating, cramps, constipation and diarrhoea too. Make sure you keep away from these unhelpful effects by consuming only small amount every day or simply split it into two different servings. In case you feel like boosting your fiber intake, increase it slowly with over a period of several weeks. Try eating one or two pieces extra every alternate day, until you are able to eat the full serving without gastrointestinal upset. According to MayoClinic.com, it takes an excess of 3500 calories in your diet to gain 1 pound and consumption of 250 calories per day from dried fruits help contribute almost 2 pounds of weight in a month’s time. 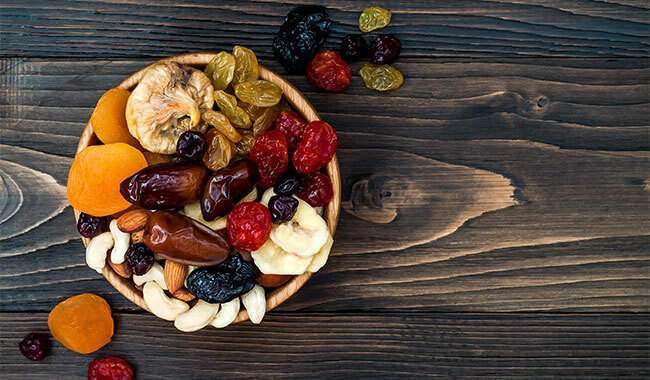 In order to minimize the caloric intake, portion your dried fruits serving before you start eating. Your serving should include three dates, eight apricot halves, 2 tablespoons of dried blueberries or cranberries and 11/2 dried figs. All these servings offer about 60 calories. 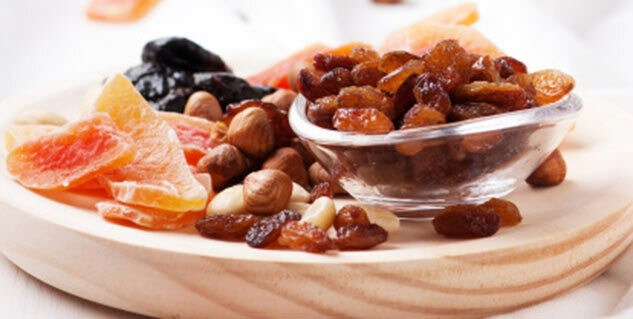 Dried fruits contain natural sugar in fructose form, which is fruit sugar and there are some dried fruits available in the market that come coated with additional sugar to keep minimum moisture levels and prevent them from sticking to each other. Sugar contributes to tooth decay and sticky foods, like dried fruits, that can be harmful because they stick to your teeth, forcing the sugar to stay on the teeth for a longer period of time. Drink water when you snack on dried fruits to minimize the risk of tooth decay and also try brushing your teeth after eating sweets to remove sugar from your teeth. There are quite a few dried fruits that are sugar coated and are also high in glycaemic index. High glycaemic food cause your blood sugar to surge that quickly delivers energy but the moment you hit the peak energy level, your blood sugar level quickly drops causing sugar crash and sudden fatigue. Raisens are known to be high on glycaemic index and have a rating of 64 according to Harvard Medical School. The glycaemic index of dates is on the average side, but prunes are the ones that have are low in glycemic index with a rating of 29 on the scale. One of the most dangerous components used is sulphur dioxide, which is known for its unpleasant smell that is created by burning coal or oil and is also used as disinfectant, bleaching agent and as a food preservative. According to the U.S. National Library of Medicine, sulphur dioxide is not harmful if consumed in small amounts, but according to Food Matters, the acceptable daily intake for a 10-year-old who weighs 21kg is about 15mg per day, which is equivalent to one dried apricot. Exposure to Sulphur dioxide can be harmful and deadly to people who suffer from asthma and those with sulphite allergies or sensitivities. It is a toxic and dangerous chemical to both our bodies and the environment. While the cons appear frightening, do not cross the dried fruit off the grocery list completely. There are studies that suggest that when eaten with control, they can be helpful for people who look at losing weight. So remember that moderation is the key.